Harris The KnowItAll has never felt at home on Earth. A world of music is where he continues to find safe haven. From the depths of East Oakland, with a soft heart wrought in an environment that can easily breed hardness, Knowy’s music encompasses self-awareness far beyond his years. His production sound is an amalgamation of ethereal imaginings and aggressive surroundings, and his lyrics are an indelible and potent description of his experiences. Poised, persistent, and patient, Harris The KnowItAll is positioning himself to become one of the most influential artists of his generation. 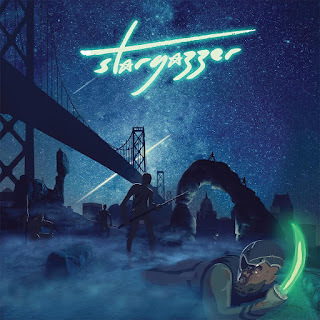 Harris The KnowItAll has been gearing up all Summer for the release of his new project, "Stargazzer," continuing to build his production catalog, and developing other young artists who seek his guidance and experience. Themed on an outer space expression, he allows himself to roam free creatively all throughout the LP. He explains that "wonder paired with a lasting love of comics and science-fiction all came together as inspiration for "Stargazzer" as a true passion project". Tune in below and peep all 10 tracks of his intergalactic body of work. It is quite the experience.